Are you wondering how to choose the best baby monitor? Don’t worry you have come to the right place. Being a parent can be quite demanding, most of the times, you’d have to juggle between a number of house chores and taking care of the baby. This can be quite stressful and by evening, you’d be too exhausted to even take a bite of your favorite dish. So what can you do to make your work easy? Employing the best gadgets to help you in taking care of your baby is often advisable. A baby monitor is one of those gadgets that you can depend on solely if you want to keep an eye on your baby all day round the clock. It will pick the slightest wail, scream, gurgle, and distress from your baby even in their sleep. You don’t have to run every two minutes to check on your baby and you can easily concentrate on one thing at a time. Here is how to choose a baby monitor for your use. 1 What Kind of Baby Monitor Should I Get? What Kind of Baby Monitor Should I Get? 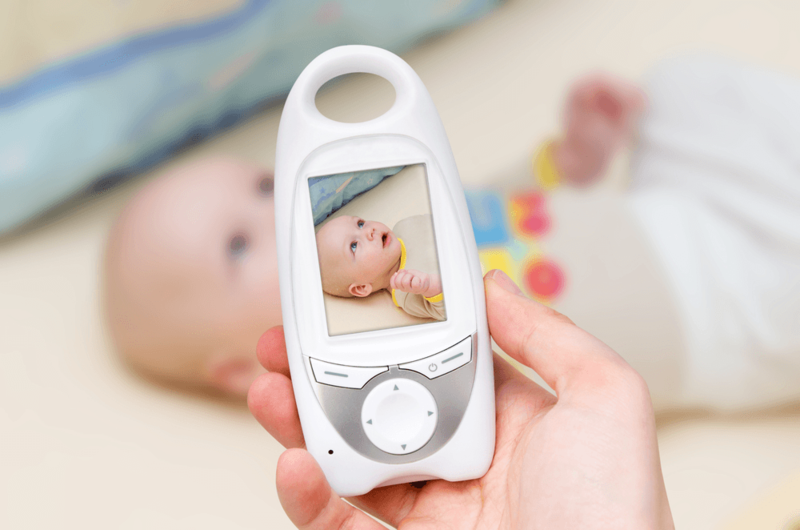 Video baby monitor has the capacity to relay real-time videos of your baby. If your baby is sleeping, for instance, you’ll be able to monitor them by seeing visuals of how they are sleeping, what position they are sleeping at, and when they are awake. Video baby monitors are also pretty good for a baby who have no nannies and are left playing alone in their cots. Audio monitors have no video relays. However, they have inbuilt sound sensors that will instantly pick up any forms of sounds that your baby makes. These sensors will, in turn, trigger the necessary indicators. Baby monitors can come in numerous combinations however the ones built with movement sensors are also good for starter parents. They are triggered by movements but will force you to still run up the stairs to know whether your baby is awake, crying, or simply changed their sleeping position. When choosing the best baby monitor, there are a number of things that you should keep an eye on. The most vital ones include the following. Analog baby monitor requires you to operate it manually. It means you will have to wash off your hands in case you were cleaning dishes. I would suggest going wireless/digital. A digital or wireless monitor will easily allow you to operate the monitor when you have your hands full. You can always clip it along with your belt to keep your hands free. A good baby monitor should have a frequency of about 900 MHz or more. This is important as it will reduce any forms of interferences and in turn boost clarity. You will easily hear your baby’s movements or even the slightest whiffs. The distance between your baby’s cot and the monitor and the distance that the baby monitor’s frequency will be relayed to you effectively are important. The latter more specifically is vital because you need to keep within an area that your signal strength is strong so that you can keep an eye on your baby. Choose a monitor that can be accessed within a good distance within the home. The type of low battery indicator that you get should be very prominent. This feature is usually very handy. It will alert you in time when your baby monitor has lost its power and prompt you to replace the batteries as fast as you should. Most top baby monitor brands are often fitted with a signal light to show how strong your battery power is. Find a monitor that has a battery low indicator. This is important in alerting you when your monitor’s power is growing low. In case your battery life expires, you can find an expert to help you replace. Look for a model that comes with a sound activated feature. Many babies will tend to move or cry especially when they are bored. It is important that you get a model that picks any kind of noise that your baby makes and alerts you in time. Though this might sound less important, that’s not the case. Young babies have very sensitive skins. A simple rise in temperature can easily leave them feeling really uncomfortable and fidgeting so much. Get a monitor with a temperature sensor to help you keep an eye on any slight temperature change. An infra-red activated baby monitor will come in handy for the night. It will allow you to monitor the baby and even send visual signals. You don’t have to jump off the bed from time to time. Instead, you can only glance up your monitor and see how your baby is sleeping. Nightlight is often found in video baby monitors. Talkback is the latest technology that most parents should go for. It helps you to strike a conversation with your baby even if they wake up and you are downstairs preparing meals. It keeps the baby company and prevents them from getting bored. How to choose the best baby monitor revolves around having your personal time with your baby. You don’t want any form of interference from outside sources. You should look for a security system that’s only for the two of you. We have seen what to look for when buying the best baby monitor. However, one thing that many parents often face is how to choose the right one (monitor) for their baby. Let me sum it up for you. What range do you have to set up your baby monitor for it to pick every gurgle, wail, or sigh? And what distance can it relay the same? A baby monitor that allows you remote access even while at the mall is the best. And basically, one that can go up to 10 feet from the baby’s crib without distortion in frequency is also good. Between three and ten feet any good baby monitor should be able to pick every sound that a baby makes clearly. If you find one that cannot do that, you should walk away. Babies’ basic language is sound, so make sure your monitor can pick even the slightest sound. Find out if the features that the monitor comes with making your work easy. The best features include night lights, temperature signals, low battery indicators, sound sensors, video relays, remote access, and smart receivers. How to choose a baby monitor can sound tricky for any new parent. However, with these tips that I have given you here, I want to believe that your work is now very easy. Let’s just say that while choosing the best monitors you should keep an eye on your baby’s need above any other things first. Additionally, you should make sure that the monitor has a number of features that will easily make your work easy such as parent unit, unit controls, color and night vision activations, zooming power, and tilt. Now get out there and get the best baby monitor for your little angel today.